Learning new things, whatever they are, keeps our brains sharp – a sentiment reflected in a recent Blue Zones Newsletter that states: Knitting, playing board games or learning other crafts during mid-life can reduce memory loss by 40%-50%. Coasting through a daily crossword puzzle is no longer considered enough. Our brains (like our muscles) need stretching – and that means embracing novelty. Researchers have highlighted learning a language or a musical instrument as being particularly beneficial but we can stretch our brains every day in simpler and perhaps less intimidating ways. One of my favorites is regularly learning a new word, but visiting museums and galleries, grappling with a new app on your iphone or a new function on your camera, trying out a new recipe, all count. Travel to new places (another reason not to repeatedly book into the same beloved beach resort), reading a challenging book, even meeting new people, help our brains to build new connections. So, yes, an old dog can and must learn new tricks. Conversely, researchers have found watching TV to be the activity least likely to build a healthy brain. According to Blue Zone researchers, older people who spend seven hours a day watching TV are 50% more likely to experience memory loss. This reminds me of the first home my grandmother lived in during her early stages of dementia: the TV was on all day and the inhabitants were placed round it in a semi-circle, and left there. We also know that exercise is imperative for good brain health. In his book, Brain Rules for Aging Well, Dr. John Medina quotes research showing active people have half the risk of cognitive impairment and half the risk of Alzheimer’s. He says our ancestors walked up to twelve miles every day, keeping both their bodies and brains in good shape. So the ideal combination must be learning something new that involves vigorous exercise, right? Well, I’ve just returned from learning something new (cross country ski-ing, which involves running up hills in long skinny skis and, in my case, falling over A LOT) in a country I’d never been to before – Norway. We typically covered 10-12 exhausting miles a day and ate vast amounts of oily fish. Herrings and salmon for breakfast, trout and mackerel for supper. In the remote hinterland of wintry Norway, the air is bracing and pollution-free, the nights are silent and the people welcoming. Unsurprisingly, Norway is 15th in the world rankings of life expectancy. And yet, despite its high consumption of oily fish, Norway has one of the world’s highest rates of death-from-dementia, multiple sclerosis and skin cancer (possibly because of the lack of sunlight, read our post here). Needless to say, my week of learning, exercising vigorously and playing scrabble with weird Norwegian letters, left me re-energised. I haven’t felt so good or slept so well in years. As I write this, an article on superagers has popped into my in-box. Superagers, a term coined to describe the small number of people over the age of 80 with razor-sharp mental fitness, do a lot of travel and reading apparently. In other words they’re exposed to novelty on a regular basis. We’ll be blogging about superagers very soon. Unsure where to start? Try the recipe below … simply following a new recipe will improve the plasticity of your brain. 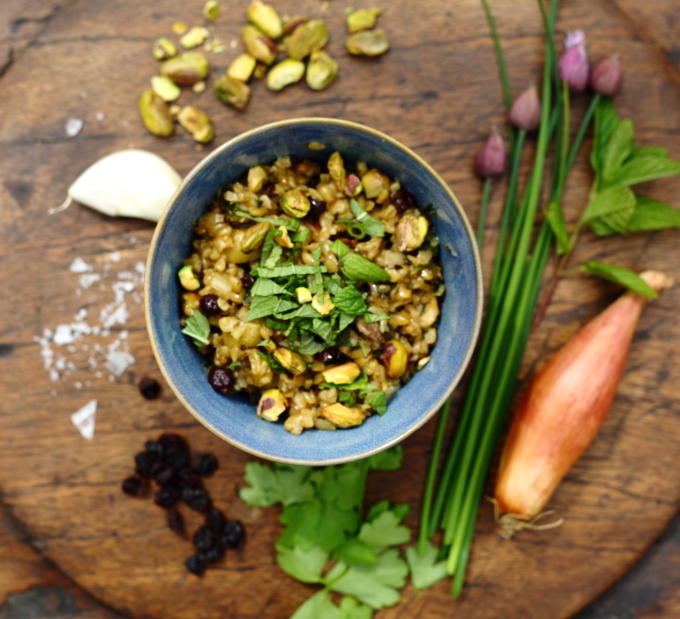 We love freekeh (read why here): not only is it a superb prebiotic but it includes plenty of magnesium while the pistachios provide a shot of Vitamin B6. Serve with some fish and wilted spinach, or add a tin of chick peas and enjoy it as it is. Heat the butter and oil in a medium pan over a medium heat. Add the onions, cook until translucent (approx. 5-10 minutes). Add the garlic, freekeh, currants and olives and season well. Pour in 500 ml boiling water, reduce heat and cover with a lid. Cook for 30 minutes, stirring occasionally and adding more liquid if it seems dry. Stir through the herbs and pistachios, reserving a few to scatter on top. This is our variation of a Turkish-Cypriot dish which often includes a tin of drained chickpeas at the end, adding to the protein and fibre content.